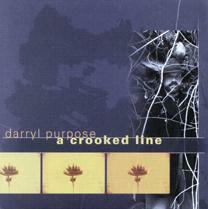 George Graham Reviews Darryl Purpose's "A Crooked Line"
I have to confess to being one of those music fans who, given a choice between instrumental and vocal music to listen to for pleasure, will pick instrumental music nine time out of ten times. All too often, reasonably good music has been ruined by bad vocals, pretentious singing, inane lyrics, and most frequently, all three. But there is something that can be very powerful and moving about a good song, well-delivered, free from pretense, that has something significant to say. And while commercial pop music has given us a truckloads of the first kind, this is also very good time for intelligent singer-songwriters who weave music and words in a way that is much deeper than the seemingly simple musical format would imply, music that can be remarkably original and entertaining, despite the thousands of artists doing hundreds of thousands of songs that have come before. This week, we have another of those singer-songwriter recording gems. It's the new, fourth album by Los Angeles-based Darryl Purpose, called A Crooked Line. Like the best of such records, its musical simplicity and directness enhances its impact. And like the best of such performers and writers, Darryl Purpose brings an interesting and rather rich background to his music. Before his musical career, and right out of high school, Purpose tried his hand at gambling with cards, and soon became a full-time professional gambler. He reached the point at which he was considered at one time the country's top blackjack player, apparently winning enough on an itinerant circuit to make a good living. But he grew tired of the atmosphere and environment, and was impressed enough with the sincerity and commitment of a group of anti-nuclear weapons activists that he spent the better part of a year crossing the country in the Great Peace March for Global Nuclear Disarmament in 1986, which went from Los Angeles to Washington. He found himself being called on increasingly to provide entertainment for the group with his guitar, and he began to weave the stories of people and events he met along the way into songs. After the march, he devoted himself to his music, and has been winning over both fans and critics with his rich narrative style and increasingly high quality musicianship over the course of three albums starting in 1996. Now, on A Crooked Line Purpose has created his best album yet, full of both narratives and character studies, with very appealing mostly acoustic musical settings that enhance the songs, but never distract from them, with never more instrumentation than is appropriate. He is joined by other bright lights on the new folk scene, Dave Carter and Tracy Grammer, whose own CD we recently reviewed, plus Boston area singer-songwriter Ellis Paul, members of the Turtle Island String Quartet, as well as a regular band including bassist Keith Lowe, drummer Todd Gray, and steel guitarist and Dobro player Dan Tyack. The album was produced by Evan Brubaker. But not all the players are present all the time. Several of the songs have a mainly acoustic guitar backing, and most of the CD has a decidedly understated sound. Purpose collaborated with other songwriters on several of the tracks, including Paul Zollo, Robert Morgan Fisher, and Ellis Paul. Purpose and Paul apparently worked transcontinentally. While much of the album was done in Seattle, Paul recorded his parts in Boston. The album ends with its most distinctive piece, I Can Get There from Here, which Purpose dedicated to those with whom he marched for peace. The accompaniment comes from a string quartet, with two being members of the Turtle Island String quarter, and the arrangement by a third Turtle Island member. In his new fourth album, A Crooked Line singer-songwriter Darryl Purpose creates a fine collection of story songs, vignettes, and character studies, in what stands as the Los Angeles-based artist's best CD. His combination of worthy, intelligent songs that often bring a different viewpoint to their subject matter, appealing vocals and excellent musicianship makes this a memorable album, even in the crowded singer-songwriter field. Musicianship is first-rate and the generally understated production and acoustic-dominated sound help to make the songs even more effective. Out sound-quality grade for the recording is close to an "A." The acoustic instrumentation is nicely recorded, and electronic effects are held in check. But CD is a bit short on dynamic range -- the difference between loud and soft -- for an acoustic-dominated recording like this. Making the transition from professional gambler to a full-time singer-songwriter, Darryl Purpose has become one of the more interesting people on the new folk scene, and his new CD A Crooked Line is definitely a reminder that the field of musical storyteller remains deep and rich, despite the glut singer-songwriter records on the scene.